Dakota has been with RCHS for awhile now. She is thought to be between 5-7 years old and she is just under 50 lbs. She’s a pretty calm and contained girl. She has a very unique looking coat and we aren’t sure what breed she is, but we’re guessing some sort of cattle dog mix. Dakota loves all new people, including kids. She is fine with most other dogs but can sometimes get annoyed with dogs that want to play with her. She would do best at a home where the other dogs in the home are more mature. Dakota loves going on walks and rides wonderfully in the car. She is mostly potty trained but has had a couple accidents in her foster home. She is healthy but will need a dental cleaning in the not too distant future. She is a beautiful, friendly girl who would work well for a lot of different families. Albert is a big, lovable guy, with a very flamboyant personality. 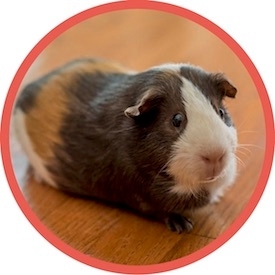 We believe he is a younger guinea pig, so he has lots of life to live and loves to give. Albert is very eager to receive pets and cuddles and doesn’t tend to run for cover when approached by humans like most guinea pigs do. He is also quite chatty and loves to tell you all about his day while you show him affection. Albert is very patient with children and doesn’t seem to really be phased by other household pets. For the most part he is a pretty confident and well adjusted guinea pig. Albert’s favorite time of the day is dinner time. During this time he tends to become boisterous, letting his humans know that they are bringing him his supper way too slowly. Albert came to RCHS significantly overweight, but with a healthy diet and exercise he has begun to shed some of it. He will need a dedicated family who can look past his begging habits and is committed to sticking to his diet and playtime exercise to help him maintain a healthy lifestyle. 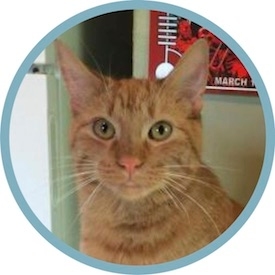 Rocky is a cute, 11 month old, orange tabby kitten with loads of love to give. Rocky is a very affectionate and people oriented boy. He likes to be scooped up and cuddled and almost always loves getting pets. He always wants to be with his people and prefers to sleep on them or at least with them. He is also very talkative and will have long conversations with you about how you should pet him and/or give him more food. 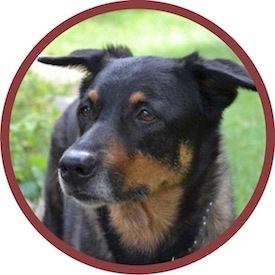 Rocky has gotten nippy with people when he is startled or if he’s in a stressful situation (especially around new dogs) and you try to pick him up. Due to this totally understandable behavior we would prefer he does not go to a home with young children. He thinks all new humans are his friends and is not a timid guy at all. Rocky adjusted to the dogs in his foster home after about 3 weeks and would probably do fine in a home with dogs that weren’t too interested in him, if given enough time to adjust to them. 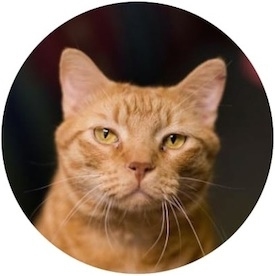 Rocky likes other cats and would love to have some feline friends in his forever home. He can play a little rough with other cats so he will need kitty friends that are fairly tolerant and able to tell him when enough is enough. He is also still a kitten and likes to play with toys, laser pointers, and his kitty friends. Thank you to all those who made it possible for Jinx and his best buddy Mojo to look for their new homes. 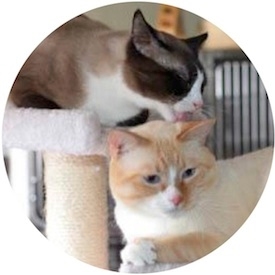 These two boys are good pals and we’d like to send them to their forever homes together. Jinx is outgoing and friendly. He will purr for pets, but he’d prefer you not pick him up. Mojo is a little on the shy side, but once he’s warmed up, he’s a sweet guy. They will be looking for a home where they’re the only animals. Jinx doesn’t like any other cats besides Mojo, and Mojo is opposed to dogs. 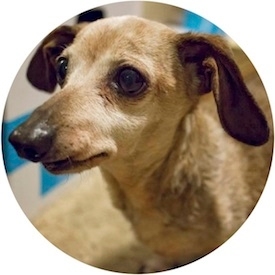 Greta is a sweet, spunky little senior miniature dachshund. She is just an itty bitty thing at 8.5 lbs. She is around 10 years old and is red speckled with grey. Greta is a lot of fun and still has a lot of go for an older gal. She loves other dogs and keeps up great with younger ones on walks. We think she likes cats but we can test her if you’d like us to. Greta ADORES toys. There is nothing more exciting in her life than a new plushy toy to carry around and maybe bury under blankets to save for later. Greta is potty trained and in good health as far as we know. She recently had a dental and will be available after her mouth heals from that. Greta is just a little doll and will make her new owners very happy! Mama Nutmeg came to RCHS about halfway through her pregnancy and gave birth to these two beautiful boys on New Year’s morning. Nutmeg is a super sweet girl who is a bit shy but has a big personality. She is very talkative when she hears the sound of a fridge door or a veggie bag rustle. She would do well with kids as long as she is supervised closely while being handled, as she is bit nervous when being picked up. Her adoption fee is $35. Her boys, Nibbler (right) and Squeak(left), are now old enough to be on their own and are looking for their forever home as well. 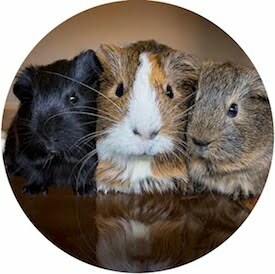 We would like to adopt them out together as guinea pigs tend to be happier in the company of other guinea pigs. They are extremely vocal little fellows and very active. They are still learning to trust humans, but they are coming along nicely as long as you have patience and move slowly. They will need to be housed in a larger cage, as bonded males often need more space to prevent squabbling. They will also need two separate hidey houses/tunnels to play in so they can be separate but safe if they so wish. Their adoption fee is $60. 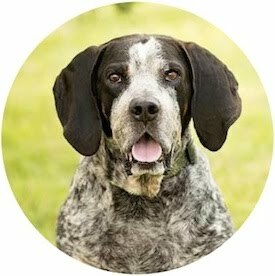 Sherlock is a friendly 70 lb, 6-7 year old blue tick coonhound mix. He absolutely loves all people, and makes it his goal on every walk he takes to introduce himself. Sherlock’s hobbies include meals, naps, rolling in the grass on warm fall days, and hunting for dog treat remnants left by his fellow dog fosters. He also likes to play low-key fetch and tug. He has done well with other dogs, but can be protective of his food bowl and bones – he really loves his food all for himself. He has also done well for his cat introductions. Sherlock is good on leash, and despite being a bit clumsy (loveably so), enjoys romping around in the grass on cool days. Sherlock would love a home with lots of human interaction. He is most interested in what his people are doing when he’s not napping. 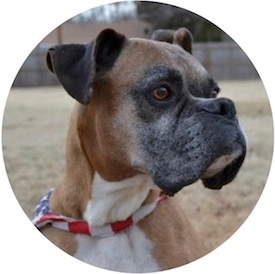 When Sherlock came to us in early May, he was heart worm positive with clinical symptoms. Since then, he’s undergone treatment and now tests negative. He still coughs on occasion, but it is likely that this will improve with time as his lungs repair themselves, post-heart worm disease. 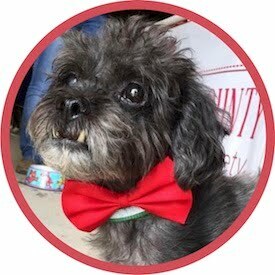 With his clean bill of health, Sherlock is now in search of his new humans!